What’s a Nice Vegetable Like You Doing in a Batter Like This? 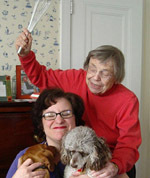 I am working on a recipe for rhubarb catsup, which I thought would be just wonderful for Memorial Day weekend. I pictured it on a nice grilled burger on top of a red, white, and blue plate. Alas, the catsup is still a work in progress. So I’m giving you a recipe that isn’t really a holiday recipe—or maybe it is. It certainly isn’t an everyday recipe since it manages to take a healthy seasonal food (asparagus) and make it into something really, really, really, really fattening. And really, really, really REALLY delicious. 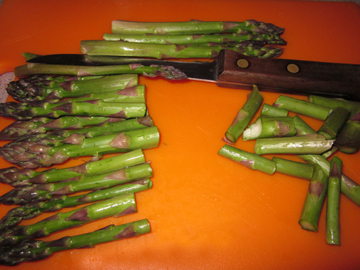 Wash and trim the asparagus spears, and cut them into small pieces—between 1 and 2 inches long. Pop the pieces of asparagus into boiling water. Return the water to the boil, and cook the asparagus for 1 more minute. Drain the pieces in a colander with ice so that they will stop cooking immediately. 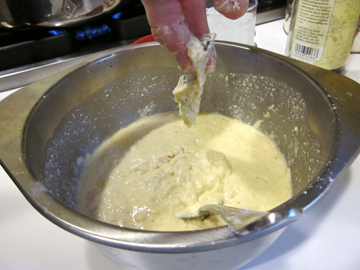 In a bowl thoroughly combine 1 cup of the flour, the baking powder, the salt, the pepper, the lemon zest, and the cheese. 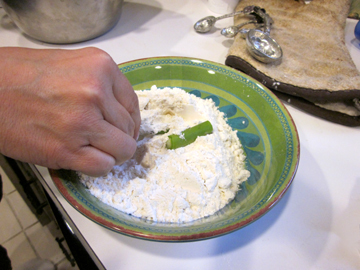 Place the remaining cup of flour in a small bowl. Pour oil into a frying pan until it is about 1 inch deep. Heat the oil until it is about 350 degrees. 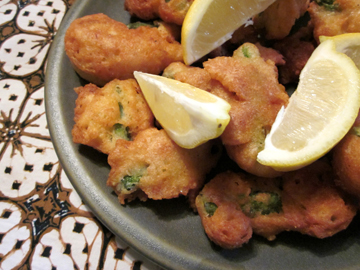 Dredge each piece of asparagus in the small bowl of flour; then dip it into the liquid fritter batter so that it is coated. 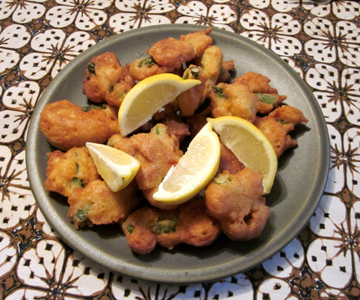 Pop each fritter into the oil and cook it quickly, turning as needed, until it is golden brown. Do not crowd the fritters in the pan! When individual fritters are ready drain them on paper towels and store them in the warm oven until all the fritters have been cooked. You may end up with a little extra asparagus if you run out of batter or just get tired of cooking. Use this in a salad or a stir fry. 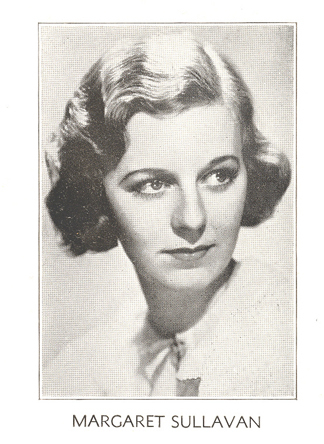 This is the photo that appeared with Margaret Sullavan's alleged recipe. Jake Jacobs estimates that it was published around 1938. 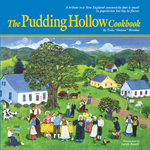 I recently purchased a CD called Hollywood Cooks! from Kathleen O’Quinn Jacobs and her husband Jake. Collectors and vendors of movie memorabilia, the two have scanned recipes and food-related stories from myriad old movie magazines. Naturally, I felt the need to try one of the recipes—and since it was almost the end of the month and I hadn’t yet posted a “Twelve Cookies of Christmas” recipe I decided to share with you the recipe for Margaret Sullavan’s peanut-butter hermit cookies. Here’s what happened: I made the hermits yesterday. They were absolutely the easiest cookies I’ve ever made, featuring very few ingredients: condensed milk, peanut butter, and graham-cracker crumbs (plus a little salt). They shaped up very nicely on the baking pan. Unfortunately, they didn’t pass muster in terms of taste. Even my mother, who at 91 eats cookies at a rate that belies her slenderness, passed by the cookie jar (which I placed out in the open hoping she would eat some of the darn things) without even stopping. She may not be able to articulate where she is or who I am all the time, but her brain retains information about pets and cookies very well. She never forgets our dog Truffle’s name. And she remembered that she didn’t like this recipe. The problem has got something to do with the condensed milk, I think. It renders the texture a bit rubbery. And frankly the cookies just don’t offer enough peanut-butter flavor. Or flavor of any kind. This probably makes sense. 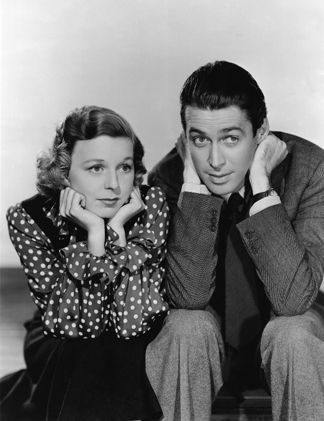 Actress Margaret Sullivan (1909-1960) is delightful in such films as The Shop Around the Corner (1940) with Jimmy Stewart. And she’s touching in No Sad Songs for Me (1950), in which her character gets ready for death in a romanticized preview of Sullavan’s own early demise. Nevertheless, nowhere in her daughter Brooke Hayward’s family memoir Haywire or in Lawrence Quirk’s biography Margaret Sullavan: Child of Fate did I find any reference to this mercurial actress’s skill in the kitchen. She probably never actually baked a hermit in her life. In order to salvage my cookie post and not abandon Sullavan entirely, I am sharing a recipe that relies on her three main ingredients (plus a couple of additional ones!). I got the idea from Borden’s Eagle-brand web site, which features a number of recipes that involve condensed milk. 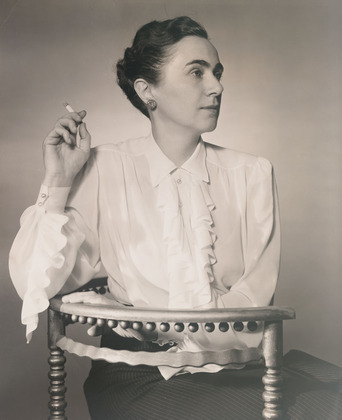 I don’t know whether Margaret Sullavan would have approved—but I’m sure that Brooke Hayward would have enjoyed my non-hermits as a child! A relative of the ever popular Hello Dolly Bars, also known as Magic Bars, they’re VERY sweet and chewy. Please keep your fingers crossed for me as I move on to my next movie-star dish…….. Thoroughly blend together the milk and peanut butter. Add salt and graham cracker crumbs. Mix well. 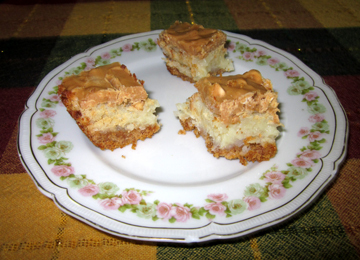 Drop by spoonfuls (I used a 2-tablespoon scoop) onto a buttered baking sheet (I used two). 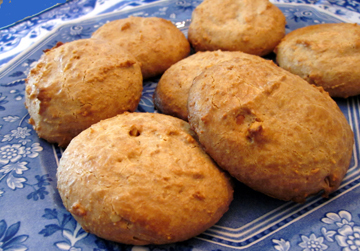 Bake 15 minutes, or until brown, in a moderately hot oven (375 degrees). Makes eighteen hermits. Preheat the oven to 350 degrees. Line a 9-by-9-inch pan with aluminum foil, and butter the foil generously. In a saucepan melt the butter. Blend in the graham-cracker crumbs, and press the crumb mixture into the bottom of the pan and up the sides an inch or so. Place the coconut on top of the graham-cracker crust. Throw on the peanuts if you are using them. Pour the condensed milk over all. Bake this mixture for 25 to 30 minutes, or until it browns lightly. While you are baking, use a double boiler to melt the chips and peanut butter together. Gently stir this mixture over the baked mixture. Cut the baked stuff into bars. Makes between 16 and 60 little squares, depending on how big you want to cut them. 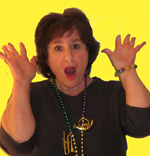 Kathleen and her husband Jake love the television series 24. Knowing that I enjoy linking recipes to TV programs, she told me of their practice of nibbling on something special each year during the season finale of 24. Since no one eats during the series (Kiefer Sutherland’s character, Jack Bauer, and his colleagues are too busy running around saving and shooting each other) the two have had to provide their own recipes. Several years ago they came up with the idea of making something from a country featured in the previous season’s plot line for each finale. Over the eight seasons of the series Kathleen and Jake have sampled Hungarian, Middle Eastern, and Mexican dishes, to name a few. 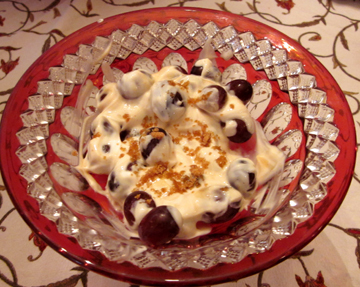 This year Russians have resurfaced on the show so Kathleen is making Grapes Romanoff. I haven’t been as faithful a viewer as Kathleen and Jake, but I have to admit to a certain fascination with 24. I know that the “real time” gimmick is ridiculous. I haven’t spent much time in Los Angeles, but I do know that it can take hours to traverse Washington and New York, the settings of the last two years’ alleged 24-hour scenarios. Nevertheless, I’m willing to spend disbelief. Here’s why: The producers have been astute over the years in courting a variety of audiences, not just lovers of action. I am NOT an action fan. I find hero Jack Bauer really, really tedious. At least half (often more) of each episode is devoted to shots of Jack as he shoots people, blows up buildings, tortures bad guys, and so forth. And the man has absolutely no sense of humor—probably because he never sleeps, eats, or goes to the bathroom. So I push the fast-forward button on my DVR and skip straight to the good stuff. That good stuff, as far as I’m concerned, comes when the storyline gets to the wonderful character actors who seem to find their way into each season’s narrative. Over the years such luminaries as Dennis Hopper, Powers Boothe, James Cromwell, and Jon Voight—to name a few–have popped in (usually as bad guys) to sweeten the storyline. And then the women come onscreen……..
Jack finds romantic interest only with skinny, rather tense babes. He has to deal professionally, however, with substantial women who are a force to be reckoned with. The restrained yet authoritative Jayne Atkinson played Karen Hayes, who went from serving as the head of the fictional counter-terrorism unit to working as the president’s national-security adviser, in Seasons 6 and 7. Jack’s ongoing friend and coworker Chloe O’Brian (Mary Lynn Rajskub) is blunt, smart, quirky, and ethical—if a bit too loyal to Jack for my taste. 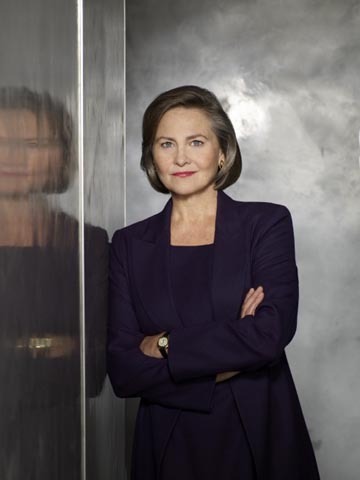 One of my favorite stage actresses, Cherry Jones, has brought gravity to the series over the past two seasons as President Allison Taylor. I’m disappointed with what has happened to her character lately (my fellow viewers will know that the once ultra-honest President Taylor was easily led into abusing her powers by the Rasputin-like former President Logan), but I can’t help enjoying her performance anyway. Most gloriously of all, the radiant Jean Smart completely stole Season 5 as troubled first lady Martha Logan. Martha was in turn paranoid (with good reason, it turned out), furious, pathetic, and strong. She was gorgeous throughout. So despite the tedium of Jack’s shoot-‘em-up moments, despite the ridiculousness of many of the plot lines, I’ll miss 24 after this evening’s series finale. I may just cry into my grapes a little tonight. I forgot to ask Kathleen for guidance in preparing these grapes. I have a feeling I added a bit more sauce to the grapes than was required! It’s hard to make just a little sauce, however. Even now I have leftover sour cream. Can Strawberries Romanoff be far behind? Lightly combine the sour cream and brown sugar. Stir them gently into the grapes. Let stand a minute or two; then serve. 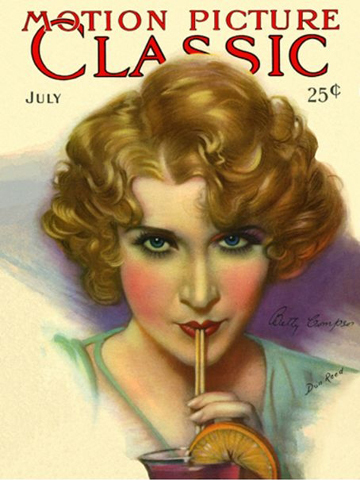 In keeping with the grape theme, Kathleen sent me this vintage image of actress Betty Compson sipping grape soda. Jack Bauer would be a happier character if he could share her drink. I could eat asparagus every single day of my life! It’s my favorite vegetable—pretty, crunchy, sweet, and versatile. I’m always trying to think up new ways to use it. I love dill refrigerator pickles made with cucumber so a few days ago I decided to try something similar with a bunch of fresh asparagus I found at a farm stand. My mother, whose tastes become sweeter and sweeter as she grows older, found my pickles a little tart. I thought they were refreshing. My only complaint was that they could have been crisper. They had more or less the consistency of cooked asparagus—cooked al dente, but cooked nevertheless. Meanwhile, I recommend them as they are. 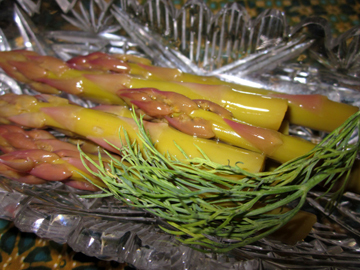 After a few days the vinegar turns the asparagus buds a gentle and pleasing pink. Snap the asparagus spears where they break naturally. Discard the part of the spear that has fallen below the break. Combine the water, vinegar, salt, and sugar in a nonreactive saucepan and bring them to a boil. Set the mixture aside to cool completely. Wash the spears, and trim them so that they will fit into your jar. Save the extra bits of asparagus for salad, pasta, or stir-fry dishes. Immerse the spears in boiling water. Return the water to a full boil and boil for1 minute. Rinse immediately and completely in very cold water to stop the spears from cooking further and drain them. 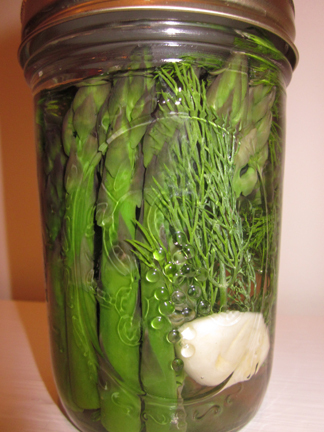 When the vinegar mixture is cool place the garlic, dill, pepper, and asparagus spears in the sterilized jar. Pour the vinegar mixture over them. You should have about the right amount of liquid. If you need a little more, pour a little tap water into the jar to fill it to the top; then cover and gently shake the mixture. If you don’t need to add water, just cover the jar. Refrigerate the pickles for 3 to 4 days before eating. Makes 1 pint.